Iowa got its first play-from-behind test Sunday afternoon against South Dakota State. It didn’t pass. IOWA CITY, Ia. — Iowa will play from behind this year. A lot. That doesn’t mean the Hawkeyes will lose a lot. But when you’ve got No. 1 Notre Dame, No. 11 UCLA and a gaudy Big Ten lineup on your slate, wire-to-wire wins will be rare. 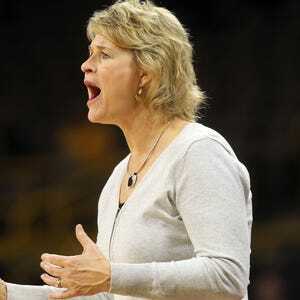 Iowa got its first play-from-behind test Sunday afternoon against South Dakota State. It didn’t pass. In fact, it really failed for three quarters before a resurgence in the final frame turned the game into a thrilling, 66-64 loss. Translation: The young Hawkeyes acted their age for the first time this season. The pitfalls of inexperience mostly rear their heads in times of desperation, and Iowa hadn’t faced any of those ahead of Sunday's matchup. They had trailed just 4:47 of their 160 minutes through a 4-0 start. And those four minutes, 47 seconds all came very early against North Dakota and Oral Roberts. Not much desperation for a team that ran underclassmen on the court 58 percent of the time. It was a different story Sunday. SDSU led all day — 38:54 to be exact. Iowa never held a lead. Now, the Hawkeyes may have been able to come back on sheer talent against many teams. Not SDSU. The Jackrabbits are the polar opposite of Iowa: They ooze experience, returning four of five starters and almost all significant pieces from a team that beat Miami and lost to Stanford by one point in last year’s NCAA Tournament. And their returners accounted for 132 points and 53 rebounds in those two tourney games. Underclassmen played 119 of Iowa’s 200 minutes Sunday. The Jackrabbits played underclassmen just 54 minutes. "I think you saw an experienced team kind of beat up on an inexperienced team today,” Bluder said. "I thought our freshmen kind of struggled, being in that situation, and I know that they are better than what they showed today. They will learn from this and be more prepared the next time." SDSU pulled ahead 31-21 with 4:26 left in the second quarter after Kerri Young’s 3. Good teams — smart, veteran teams — can maintain comfortable leads like that, especially on the road. They don't let teams sneak up on them. And until midway through the fourth, SDSU did just that against the Hawkeyes. A Megan Gustafson basket brought Iowa to within single digits, 38-30, early in the third. SDSU then answered with two quick baskets to go back up 43-30. Alexa Kastanek later drained two free throws to make it 46-39 with 3:07 left in the third. Two of SDSU’s returning starters, junior Ellie Thompson and senior Clarissa Ober, answered with an 8-2 run to close the third at 54-41. Ally Disterhoft and Gustafson seized control of the game in the fourth. They scored 16 of Iowa’s final 23 points, dragged their team back into the game and nearly eked out a win. But that’s not ideal for Bluder. This whole season, she’s praised her depth as perhaps the best she’s ever coached. It's a major strength of this team, Bluder says, that should prevent the need for individuals to take over, game-in and game-out. A lot of that depth is young, though — namely the four active freshmen: Makenzie Meyer, Bre Cera, Kathleen Doyle and Bre Cera. Other than Doyle, who played the whole fourth quarter, no freshman logged more than 20 minutes. They combined for six points on 3-of-11 shooting, five assists and five turnovers. It’s early. But Bluder will probably sleep better once she sees her team can grow up in 40 minutes and muster a comeback win.